This batch yielded 300 bottles for the world. Bainbridge Yama Single Grain Japanese Mizunara Cask Whiskey takes its name from the village of Yama, founded on Bainbridge Island in 1883 by Japanese immigrants coming to Bainbridge Island to start new lives and realize new opportunities. The small Yama village was a thriving place, with a traditional Japanese teahouse, Japanese baths, Buddhist temple, a hotel and shops and populated by Japanese families with lots of children. The closure of Port Blakely Mill in 1922, an employer for many of the men living in Yama, caused village residents to relocate to different parts of the island where they took up farming or opened shops and other small businesses. Bainbridge Yama Mizunara Cask Whiskey begins its journey from grain to glass in the fertile fields of Washington state's Skagit Valley where organic Full Pint and Alba barley is grown on a family farm near the saltwater confluence of the Skagit River and the Puget Sound. After harvest the barley is trucked 77 miles to Bainbridge Organic Distillers facility, where the un-malted grain is milled, mashed and fermented. After fermentation the mash is double-distilled. Cuts are made "by hand" and based on the qualities of the spirit as it flows from the still. After the second distillation the whiskey is diluted to 126.5 proof in preparation for being introduced into the virgin Mizunara casks. Bainbridge Organic Distillers' Mizunara casks begin their life in the forests of the northern Japanese island of Hokkaido. A very small number of Mizunara oak trees (Quercus crispula) are hand selected for harvest based on the vitality of the tree and the straightness and quality of the wood. After harvest the Mizunara oak is quarter-sawn and then air-dried in Japan for at least 3 years. When the rough wood has fully seasoned Bainbridge Organic Distillers imports the wood to the United States. After inspection the rough sawn wood is sent to a small 4th generation family-owned barrel cooperage where it is expertly fashioned into 10 and 15 gallon barrels. Bainbridge Organic Distiller's Japanese Mizunara oak casks are made from some of the most rare and celebrated wood in existence today. After barreling Bainbridge Yama whiskey will rest in 100% virgin Japanese Mizunara oak cooperage until it is mature and ready for bottling. The combination of small barrel size, oxidation encouraged by the porous nature of Mizunara oak and storage in the warm stillhouse within sight of the copper still creates what we think are the perfect conditions for maturing whiskey in this incredibly unique and special wood. The finished whiskey bears this out. Ruddy copper in color, Bainbridge Yama Whiskey is un-chill filtered and free from additives, flavor enhancers and coloring agents, and bottled at 90 Proof or 45% ALC./VOL. Bright aromatics of mango, vanilla, toasted sandalwood, tropical flowers, marzipan and star anise. Flavors open on nutmeg and clove, pear and toasty wood notes, settling out to honeyed vanilla and toasted marshmallow. Finish is warm and lingering with fading spice and a pleasant oak grip. 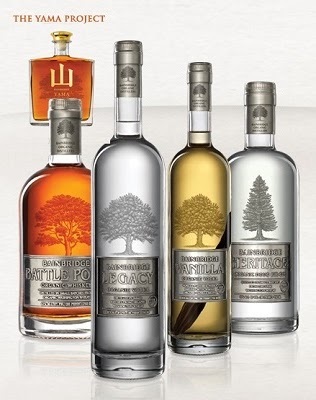 This is a full-flavored vodka four-times-distilled from organic soft white wheat and evocative of the grain vodkas distilled in Eastern Europe during the late 19th and first half of the 20th centuries. It has a wonderful grain character, with a hint of sweetness derived from the wheat, followed by both citrus and berry notes, and finishing with the aroma of grain and vanilla. JUDGED THE WORLD'S BEST VODKA from a field of more than 1000 competitors at the World Drinks Awards in London. Our first flavored vodka combines the lush and sensuous flavor of genuine organic Madagascar vanilla with our award winning four-times-distilled Bainbridge Legacy Vodka. The process is simple. We take 3 or 4 of the highest quality hand-harvested USDA certified organic Madagascar vanilla pods and place them in each bottle by hand. The vodka and vanilla beans spend at least 4 months ”getting to know each other“ in the bottle. As the vodka slowly seeps into the pod it liberates its lush vanilla essence. Unlike artificially flavored vanilla vodkas, or vodkas flavored with processed vanilla extracts, our vanilla vodka's flavors are rich, full and complex, with a taste and aroma like no vanilla vodka you've ever tasted. A wet gin by definition, this American wheat gin features 10 organic botanicals including juniper, orris and angelica root, 2 types of citrus peel, whole licorice root, coriander, cardamom, fennel seed and Douglas fir, freshly harvested in northeastern Washington State a day prior to the final distilling of each small batch. The flavor is full and lush, without being harsh or astringent, with pronounced essences of juniper, licorice and cardamom with a heady evergreen fir aromatic. Our gin's unique green tint comes from the Douglas Fir, extracted from the needles by our still's Carter-Head inspired set up. A single-grain whiskey, fermented on estate-grown soft white wheat utilizing a unique combination of yeasts usually employed to make Irish and Scottish whiskies, double distilled and aged for 2 years in new, No.3 charred, ten gallon American white oak barrels. The flavors are rich and complex, with notes of vanilla, eucalyptus and sherry, and a nose redolent of fresh barrel char, and a lingering finish with a bit of salt-air brine. JUDGED BEST AMERICAN WHEAT WHISKEY by World Drinks Awards in London.